La Rinconada, 5,000 to 5,400m above sea level, corrugated iron shacks, glued to the hills of the surrounding mountains, home to some 50,000 to 70,000 mining inhabitants and competing mafia mobs that control them. La Rinconada, in the Peruvian Andes, the world’s highest, chaotic, poisonous and illegal goldmines, some 210 km northeast of Puno, a 4-hour drive by car over partially paved, albeit potholed roads. 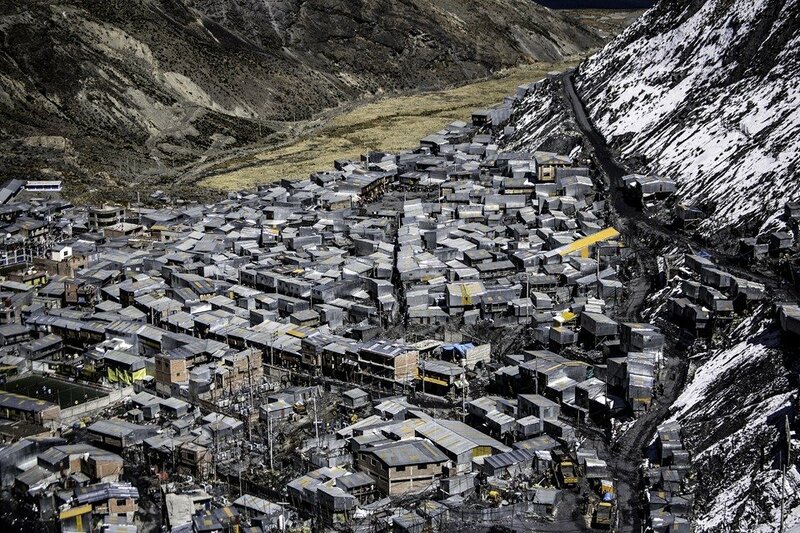 La Rinconada, near the just slightly more civilized mining townof Ananea (about 4,700 m above sea level), is also considered one of the most horrific places on earth: a crime gang-run city, spreading through a valley and up the hills, no running water, no sewerage, no electricity grid. La Rinconada looks and smells like a wide-open garbage dump, infested by a slowly meandering yellowish-brownish mercury-contaminated brew – tailings from illegal goldmining – what used to be a pristine mountain lake. Human rights do not exist in Rinconada. Child work is common place. And so is child prostitution, women and drug trafficking. Time off is a life of drunkenness and drug deliria. Life is worthless. See also Andre Vltchek’s essay. Miners come voluntarily. Nobody forces them. Most are poor. Some are just greedy – the never-dying ‘Gold Rausch’ attracts them. 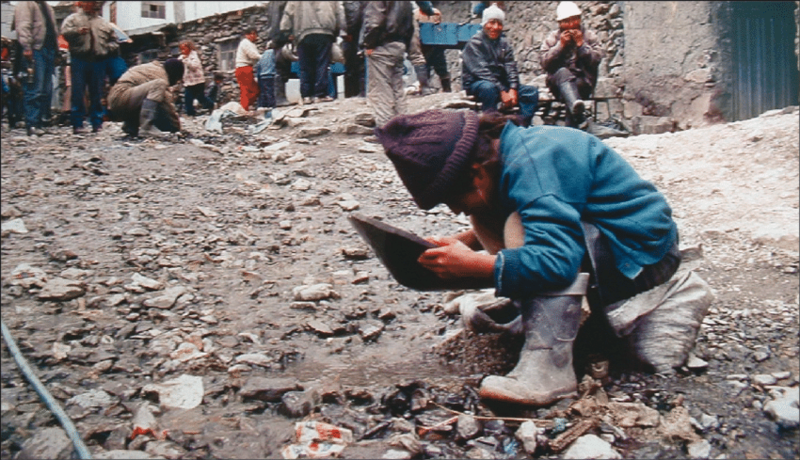 The dream of getting rich in the goldmine makes them accept the most horrendous working and living conditions: surviving in an open dump-ground of everything, garbage, toxic heavy metals, wading in mercury-polluted tailings, thin air, contaminated by poisonous vapors, no heating, most of the year sub-freezing temperatures –trash and debris everywhere. But the miners don’t complain. Some bring their wives, few bring also their kids – it’s their choice. Some stay ‘temporarily’ only, 6 months, 12 months, 2 years? – For some the dream of hitting the riches never dies; they stay until they die. – They know they will be abused, enslaved. They know, they can take it or leave it. Miners work for usually long hours and are working during 29 days for free. On the 30th day they may keep whatever they take out of the ground, amounting to about 800 to 1,000 Soles per month (US$250 – $320). Sometimes day 30 brings nothing. Sometimes some rocks with traces of gold. All are hoping for a gold nugget. 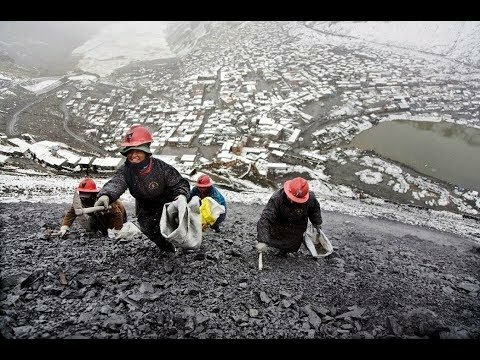 This type of mining wage is not unique to Peru. Bolivia and other Andean countries that are open to the most environmentally and socially destructive industry – mining – apply similar systems. The illusion to hit it BIG by finding the legendary ‘gold rock’ is a passion; it is obsessive. And if and when a miner does find a treasure to keep, he is vulnerable of being robbed, even killed, body discarded – another miner gone missing. Or not. Just disappeared. Maybe in a garbage dump. They are endless in Rinconada. They reflect the character of Rinconada. Refuse, waste, stench and death. That’s the level of ethics one of the richest and reputedly most noble countries of the universe applies to keep her corporations happy. Naturally, Switzerland is also the only OECD member that allows her parliamentarians to sit in as many corporate Boards of Directors as they wish. Imagine! – A totally legalized conflict of interest. And nobody says ‘beep’. The Swiss populace just accepts this blunt aberration – most of them don’t even know it exists. They live comfortably and well, and don’t care much about Human Rights abusing corporations, and less so that their Parliament is a humongous built-in corporate and banking lobby. In this environment of white-collar illicit behavior, corporations like Metalor and Glencore flourish. A recently launched people’s referendum propagating ‘Responsible Mining’, was undermined in the Swiss Parliament by the ‘built-in’ mining lobby. It is common practice that Parliament, as well as the executive give their votum before the public vote on a referendum, another unfair practice, as it influences the voters’ final decision. Case in point was Germany. By tradition Germany had about 1,200 tons of gold, worth about US$ 50 billion, deposited in the FED in New York. In 2013, when the Germansawareness that their gold is being stored outside ofGerman borders resulted in a public outcry, the Bundesbank wanted to withdraw and repatriate all of their foreign stored gold by 2020, but the FED said no, they could not deliver. The gold was simply not available. Was the FED using the German gold and the gold of so many other countries deposited in the FED’s treasuries for speculation – rent seeking with somebody else’s assets? Blood and crime are intimately linked to gold, it seems. Our western monetary system was for a long time backed by gold. Today, western moneys are fiat money, not even backed by gold, just hot air. But the Russian ruble and the Chinese yuan are backed by gold, as well as by their respective economies. – Who knows – as a last-ditch effort to save US-dollar and the western fiat money pyramid from collapsing, the west may again revert to some kind of gold standard, a man-made folly, when in fact, the only real value reflected in a county’s monetary system, is its economy. Back to La Rinconada, Metalor and Switzerland, home of more than two thirds of the world’s gold refining – how much of the reserve gold in the coffers of countries around the world is “blood gold”? – How many people, children and eventually entire generations have to live in misery, their health degenerating from exposure to heavy metals and eventually leading to early and painful death, until human consciousness is able to stop the gold craze? – Closing down hellholes like Rinconada and Madre de Dios mafia-run, all-destructive gold mines? – And hundreds more of similarlydevastatingtypesmines around the world. Perhaps when the value of gold becomes what it ought to be – its industrial value, and nothing more and nothing less, humanity becomes richer by the values of human decency and respect for each other.